In Cursed Court, there are three rounds, or years, that are all the same - at the end of the year there will be a certain number of cards that were played, and only those cards score points. At the beginning of the year, one card is dealt between each player, and each player will secretly know the two that are next to them. So there will be overlap in knowledge with your neighbors, but not complete overlap. Each season of the year, a new face-up card will be shown before players bid on spaces on the board. The spaces on the board correspond to the cards that are out. You can bid on a Noble Region - a specific card to score points based on how many of that card appear, or you can bid on a Set Region - a set of 3 or 4 cards to score 3 or 4 points. Each bidding spot can only have one player, and in order to kick someone out, you have to bid twice as much as their bid. So you can try to bluff a bid to make someone else think a certain card is played, or try to bid the right amount so no one will want to double your bid. Points are tallied and everything is reset each year, and at the end of three years whoever had the most points wins. 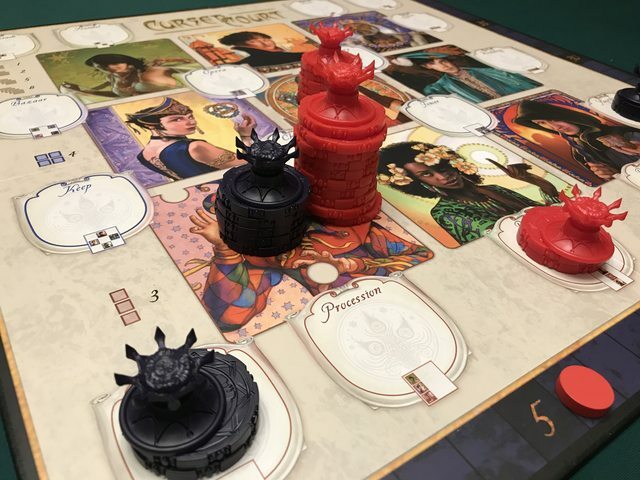 I only had the chance to play Cursed Court a couple times - once with 4 players and once with 2 players, but I was pleasantly surprised by the game. I usually don’t like pure bluffing games, but the amount of bluffing in this game was perfect for me. It was really fun wondering whether someone else bid on that card because they knew it was played, or if they were bluffing to try to get you to outbid them. And you don’t want to bid too much on a bluff, because then you’ll win something that doesn’t get you points! The round structure was a little weird, since all three year are the same and there is no ramp up or continuity (and no indicator of which year it is), but that actually helped because in our first game a player needed to leave after one year, and someone else took over for them. Sometimes you'll use a lot of chips to bump a bid, since you need double! The game played better with 4 players than with 2. With 2 players, instead of sharing information at the beginning, each player knew 2 secret cards that the other player didn’t know. Because there were fewer players, there was less bidding and less bumping of the bids. 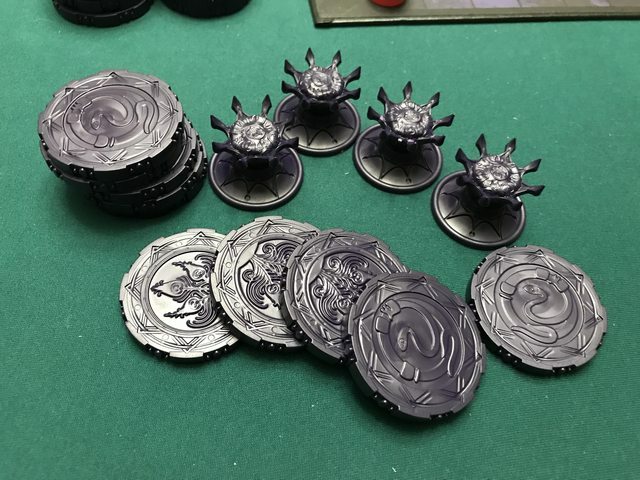 It was still fun with 2 players, but not as much as with 4. There are also a few variants to the game that I haven’t tried out - one removes the played cards each year so that the probabilities of certain cards showing up changes. It seems like this would add continuity to the game, and help make each year different. In another variant, you mark the bottom of one crown, and you don’t score that crown, so you can bluff a lot more with that variant. Overall, I really enjoyed Cursed Court. 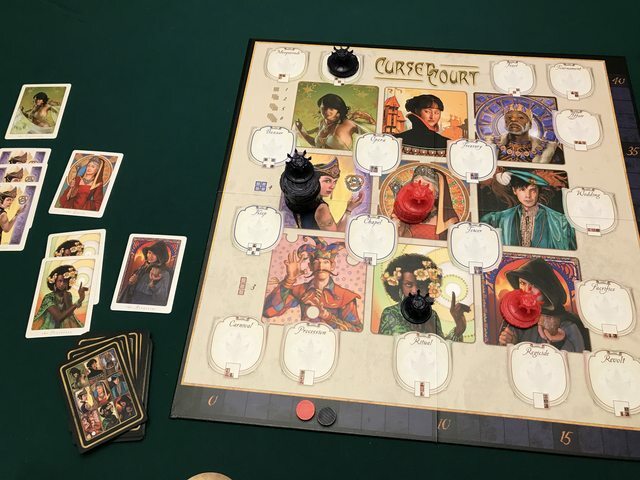 I think if you like Poker type games with bidding and bluffing, then Cursed Court will be a good game for you. 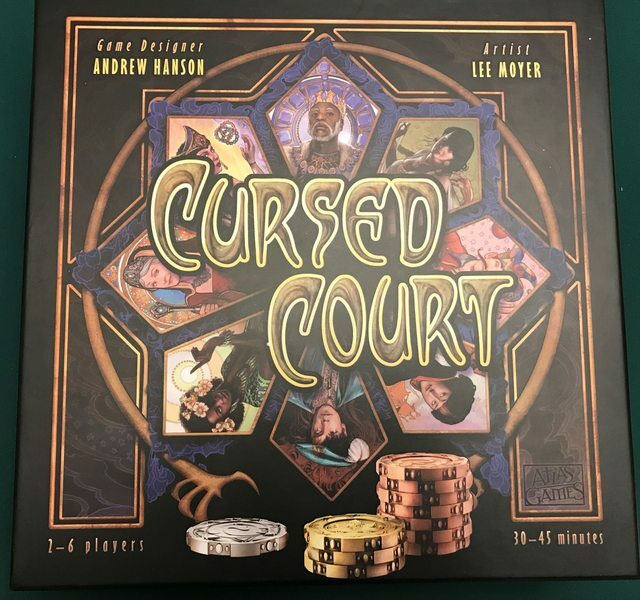 If you’re interested in Cursed Court, it is available now.